Happy 2nd Birthday Dyv Paul! For his chocolate flavored cake, we shaped it into a car, airbrushed with red icing. We then added in details like that of Lightning Mc Queen, from the movie, Cars. Chocolate cookies were used for the wheels. 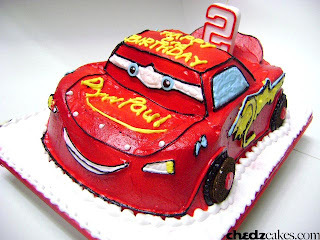 Here's another Lightning McQueen cake, for Jasper Josh's 1st birthday.